Born in 1882, it is said that our artist was shy, introspective and conservative. As it couldn’t be in another way, his paintings reflect such taciturn state. The motif of his work is quite characteristic: scenes of everyday life in the American society of the beginnings of the century, portrayed in an intimist, reflexive and melancholic way. Although his characters are usually alone, when he paints a few in the same canvas, he does it without interaction, alienating them one from another continuously. In 1923, Hopper gets married with Josephine Nivison, another artist, described as an open, social and liberal person, exactly the opposite to him. But is her who motivates his husband to keep creating and gives him the proper drive. Since the 20s, USA suffers a radical change: with the industrialization, a mass migration of the rural population to the cities takes place, in order for them to seek new opportunities. House by the railroad is characteristic of our artist for 3 reasons: the motif, the tone and the illumination. 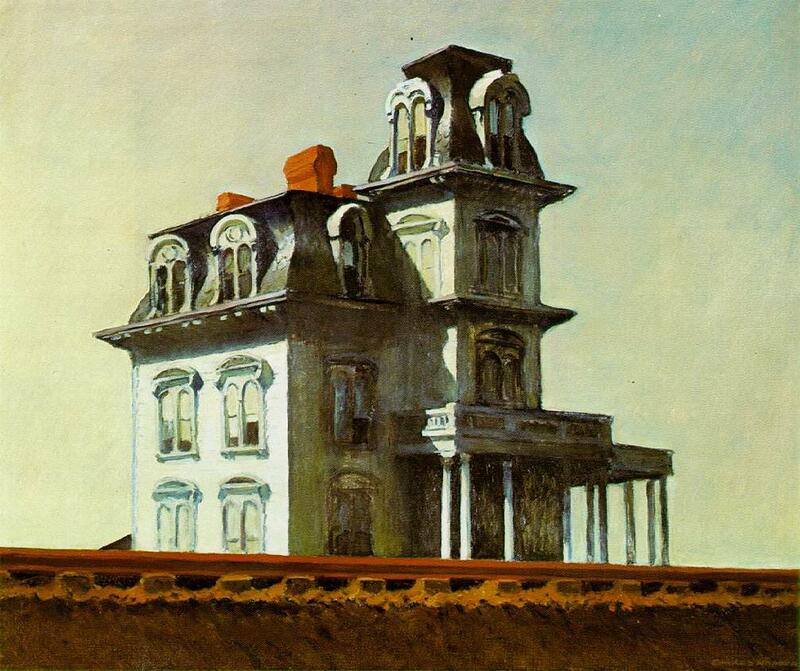 Regarding the motif, Hopper uses the railroad as a metaphor of the change the industrialization had in the society. Although the windows are closed and you cannot see the inside of the house, one has the sensation that it is abandoned and that the splendor once had is slowly disintegrating and soon it will become ruins. The tone is melancholic and sad: before the alienation of the cities, the integration and belonging of the small towns are lost forever. This feeling, by associative logic, would imply a soft, subtle light, however, here we see Hopper at his 100%: the light is white and bright. The artist correctly believed that the light is white and that’s why he always resisted to give it a more yellow or orange tone, as usual. This way, he always achieves strong contrasts between the bright sunshine and the shadow it projects; but not because of that he loses effectiveness in the theme he portraits. ~ by Álvaro Mazzino on October 20, 2010. The mid-range Samsung Galaxy S5 Neo is not as powerful as the 2014 flagship Galaxy S5. The housed processor unit cannot beat the octa-core (Samsung Exynos 5422) processor or the quad-core (Qualcomm Snapdragon 801) SoC, notes Phone Arena. This entry was posted on October 20, 2010 at 12:02 and is filed under Realism.You can follow any responses to this entry through the RSS 2.0 feed.You can leave a response, or trackback from your own site.